The innovative multi-purpose 6202D easily accommodates most stretchers, yet it occupies amazingly little floor space. It can also be used as a Wheelchair, Chair or Stand-On Scale. Mounted snug to the wall, it has a mere 4" profile when not in use. 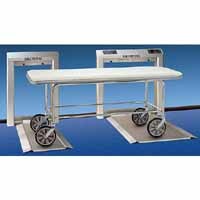 The spacious weighing platforms are balanced to fold down easily, no bending or lifting is required. The digital 6202D automatically turns on and zeros as the platforms open. Shut-off is also automatic. The weighing surface is only 1 1/2" high for easy patient access. Capacity is 880 lb/400 kg. Six D-size alkaline batteries supply approximately 20,000 weighings. At the press of a button, the 6202D re-weighs patients while they remain on the scale. Other advanced features include Weight Recall and Automatic Zeroâ€”for weighing a stream of patients without delays. 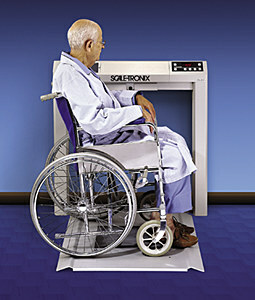 An optional printer is available to record patient weight. Computer output capability is available as well as a stainless steel, wall-mounted height gauge. Weighing Range: 880 lb-400 kg. Readout: Digital LED display in pounds and kilograms. Power Source: Cordless, 6 D-size disposable alkaline batteries. Automatic Zero: Returns to zero ready for next patient. Platforms: Low profile â€“ fold flush against the wall. Platform A, 24"w X 30"d X 1 1/2"h.
Overall, 40"w X 40"h X 4"d.
Platform B, 12"w X 30"d X 1 1/2"h.
Overall, 27"w X 40"h X 4"d.
Weighing Mechanism: Electronic load cells. Successive Weighings: Weigh a continuous stream of patients without zeroing. Height Gauge: (Accessory) Wall mount, stainless steel, in/cm.